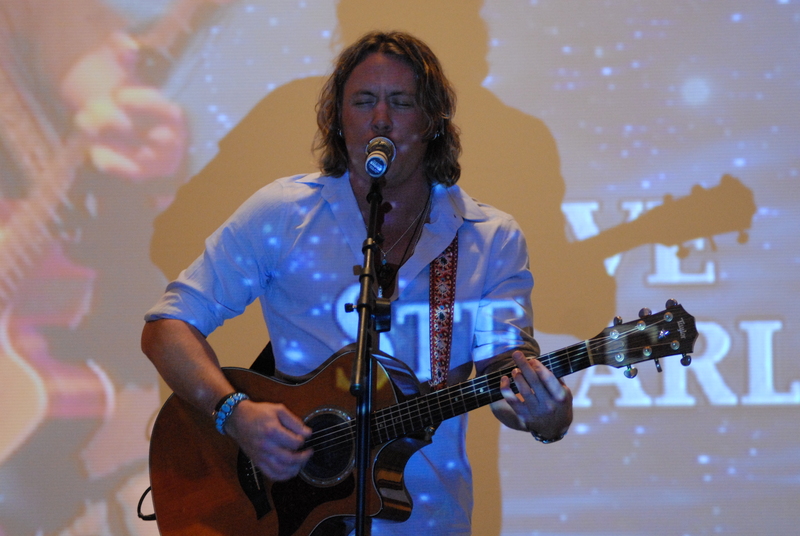 The first time we heard Steve Carlson’s music was as our ‘roadtrip through Supernatural fandom’ was just beginning. We were in Fort Worth, Texas, at a community theater production of A Few Good Men. A few days before, we had (with alarmingly little warning) left families and jobs behind to fly halfway across the country just to see One Good Man – the one who played Dean Winchester on the Show we’d fallen in love with. It was our first time meeting other Supernatural fans, and the first time we threw caution and briefcases to the wind and let our inner fangirls out to share the squee – though it wouldn’t be the last! We met a fellow fangirl named Amy in the Barnes and Noble, and bonded over our love of the Winchesters. That night, we crowded into her jeep and Amy put a song called “Wasted Jamie” on the CD player. “This is Steve Carlson,” she said, “And he’s amazing.” Oh, and that guy singing backup? Holy crap! Who knew Jensen could sing too? We drove around Fort Worth with the windows down singing “Wasted Jamie” at the top of our lungs over and over, probably much to the dismay of the local residents. Whenever we hear that song, it brings back memories of that wild and wonderful first trip, when fandom was brand new and we were head over heels in love with the Best Show on Earth. Okay, maybe that last part hasn’t changed much. But Steve Carlson’s music invariably brings a burst of nostalgia and fondness, remembering the beginning of our Supernatural adventures. So we’re very excited that Steve has some new music coming out! Lynn: There’s an eclectic mix of awesome songs on Sharing the Covers. How did you choose the songs? Steve: Most of the songs off ‘Sharing the Covers’ were songs that I’ve been performing for years… either on stage or for friends. Some of the songs I chose didn’t make the album because they simply didn’t fit the vibe and tone of the entire collection. Kathy: Do any of the songs have personal meaning to you that you can share? Steve: The last song, ‘A Long December,’ does because it was written by Adam Durtz in a friend’s back yard many years ago. I have always loved the song. I grew up in and around Laurel Canyon. My grandfather lived there since 1962, so I remember it back from when I was a child. Later on in life, I ended up living there myself. It has a charm and mysterious attraction that seems to trigger inspiration. Lynn: Speaking of inspiration, you mentioned at your recent VanCon Q & A that Jensen had come to you saying there was a song he wanted to sing – what was it about ‘Angeles’ that made him want to record it? Steve: Well, you would have to ask him that. Lynn: (silently) Great idea! Can you get him on the phone? Steve: I know he’s loved the song for a long time, enough to where he learned to play it — and it’s not a simple song to play on the guitar. After a small dinner party, he just grabbed a guitar and started playing it. I happened to have a mandolin in my hand and we played the song all the way through. Someone said “Y’all should record that” so he pulled me aside and basically told me that he had been wanting to record it and asked if I wanted to throw it on an album. I think it’s a nice way of getting that side of himself out there without making an entire album or project from it. He lives a busy life and I don’t think he has the time or the desire to strongly pursue a musical career, but he loves doing it. I’ve played music with him for years since we first met. Kathy: And you and Jensen are writing a few songs for your other upcoming album – can you give us an idea about any of those songs? Did you come up with the ideas for them together? Steve: We wrote one song together that basically sets the tone for the entire album. It’s the title track. We came up with the idea together when we were sitting on his balcony having a drink and probably talking about life. We both spend a lot of my time traveling, I just happen to mostly live on the road. That was the initial topic of conversation, the rest became the song. Lynn: You mentioned that you and Jensen write well together because you’re both very visual, and things tend to flow and come together quickly. Can you talk a little more about how being visual impacts the songwriting process? Do you ‘see’ the scenes from a song in your head before you actually write it, as some writers do when they’re composing fiction? Steve: Not always. Sometimes I see things. Most times I feel things. Words come forth like little messages from a place I hold sacred but have no idea of their origin. I’d like to believe it starts with my soul and then runs through channels of my mind that have several other influences, including life experience and inspiration. Kathy and Lynn (are nodding – because it feels like that sometimes for writers too): You also talked about the emotional impact of performing a song and seeing people singing the words to songs that came out of your head. Is that one of the most rewarding parts of writing your own songs, and of doing concerts? Lynn: How did you feel, the first time that happened? Steve: I felt overwhelmed by it. When a large group of people take over a room with the melody of your lyrics, it’s beyond magical… it’s euphoric. Kathy: Jared Padalecki filmed a video of you and Jensen recording Angeles – can you tell us anything about it? When and where will the videos from this CD be released? Steve: Everything comes out on September 18th. Jared shot a very small portion of the video. We shot almost the entire thing with our iPhones. We wanted that raw, sort of underproduced feel to it. It was all very casual. These guys spend their entire day under lights and in front of cameras so the point was to make it fun and light hearted. It turned out well. It’s exactly what we planned for, nothing more and nothing less. Something that the fans could enjoy watching rather than a slideshow on youtube. Steve: Well, the video is not telling a story. It’s more of a performance piece. There’s no acting or any major story plot. I think we both just agreed that still pictures of a character he plays or the car he drives on the show wouldn’t really do justice to the work that we put into the song. Not that I am disregarding those videos because they certainly serve a purpose but we worked hard on the song. We both traveled a bunch to put it together and we figured why not document the making and put it out there with the release of the album. Lynn: I loved the jam session that you and Jensen did in Nashville a year ago – you both seemed very comfortable and the songs seemed to take on a life of their own, sort of flowing organically the longer you played and riffed off each other. What was your experience of that jam session? What was most enjoyable about it? Steve: That it was small and intimate. I think that setting plays a major part in what made it cool. I also don’t think Jensen would have felt comfortable in front of any larger group of people. Which in turn would translate to both of us performing. I don’t think at this point (and this may change) that J wants to pursue a career in music… that being said, he loves music. Filming a TV show is done in parts that are never shot in order. You film different scenes at different times. Most theater actors will tell you that they love the stage more because there is resolve. You have a start and an end. You get a reaction. That reaction can be like a drug. It can motivate you to press on even through bad performances. As his friend, I would encourage him to continue to do small settings because they’re more comfortable and there’s less distraction. Us (silently) Jensen, are you listening? But seriously, that’s one of the great things about cons, as many of the actors have said. In fact, Jensen said something similar at his VanCon Q&A – that coming to cons and meeting fans in person reminds them why they do this, and makes the long workdays have meaning. Performers need someone to perform *for* — and that’s us! Lynn: I loved what you said about no one slowing down to appreciate great art these days – music, film, etc. One of our good friends is filmmaker Night Shyamalan, and we’ve had a similar discussion. Everything is rush rush rush, get to the explosions, don’t take your time telling a story, etc. I hadn’t thought about it applying to music, but it really does. What are your thoughts about whether this will get worse or better? Steve: Let’s hope for the latter. M. Night is a great example of someone who takes his time to tell a story and I hope that is an influence to other film makers. I think the best thing any artist can do is to continue to hold their ground and focus on their integrity. The best thing the people enjoying that art can do is to continue to support it. Us: Now that? We can most definitely do! For sale everywhere on September 18th! Thank you for this, ladies! I loved reading it – and remembering the whole panel with Steve in Vancouver, which I really loved recounting myself over on the Winchester Family Business, http://www.thewinchesterfamilybusiness.com/archive-articles/33-con-reports/17338-bardicvoices-vancon-reports-part-two-steve-carlson.html Whee! (Hard to believe “A Few Good Men” came before Something Wicked as a fan event, isn’t it?) Can’t wait for the album to come out, and was delighted to hear Steve single out Adam Duritz’s “A Long December,” because that’s the one cut (besides Jensen’s!) I’m most eager to hear. We’re loving all your reports from VanCon, Mary – great job!! Now that we’ve heard what Steve had to say about ‘A Long December’, plus your rec for it, we can’t wait for that one too! Thanks again for the insight into how Steve and Jensen view their music. Sept. 18th is going to be quite a special day with the release of Steve’s album, the video and also S7 of Supernatural! I’m a super fan of Jensen’s like you, so I’m gonna be conflicted on what to watch or listen to first! I love that Jensen’s friendship with Steve is so multi-functional, allowing J the opportunity to perform his music a little, introducing Steve’s music & great personality to all the Supernatural fans, and just giving us another aspect of what makes Supernatural’s family so special. I ordered Steve’s CD after his last Stageit concert so I’m anxious for it to arrive. Maybe Jensen would honor us one day by doing a Stageit concert with Steve. That would be small and intimate, just the guys playing their guitars in the safety of their living room…with a few very happy fans listening in! – B.J. That’s kinda already happened! Last year Steve did a Stageit concert with Jonah on percussion & keyboards and right at the end Jensen came on and sat in the back and played guitar on a U2 song. It’s on youtube here: https://www.youtube.com/watch?v=QnCS2_wzbsQ starting at about 3:30. Maybe next time Steve can get him to sing, too! Thank you, ladies. You know how I love Steve’s ,usic, and the fact that he’s finally putting “Running to Stand Still” out there makes me happy… and Jensen too. I am desperately waiting for the release. Both releases! Thank you Steve for putting all this together. Just one thing, please stop releasing stuff in UK and making me wait forever for Canada Customs to let me have my CD. They take WEEKS! We do know how much you love Steve’s music 🙂 Let’s hope you get these new ones faster — c’mon Canadian Customs, this is important!!! I can’t wait to hear the full version of Angeles and the whole covers album. The clip I heard of Jensen singing the song was amazing. I’m also looking forward to Steve’s original release in a couple months. It’s sweet that Steve realizes Jensen feels most comfortable performing music in front of small groups, shows what a good friend he is, being as supportive as he is. Thank you girls for another great interview. You’re very welcome — with all of these folks, interviews are truly a pleasure! It’s so good to hear that they play off each other so well and really love working together. I actually ordered the CD without looking at the track list – I completely trusted Steve in whatever covers he’d chosen for the album. After the 30 second teaser of Jensen’s song was online, I read many comments like “suprised that Jensen really can sing” — come on! Even when he sang Bon Jovi out of key as Dean Winchester he sounded better than many singers! LOL, and Jensen is definitely a better singer than Dean! We agree, he has real musical talent — and some very talented musician friends in Steve and Jason. Lucky for all of us! Pingback: Supernatural Minds :: Your french fansite for everything Supernatural. Pingback: Steve Carlson fala sobre video com Jared | Jared Padalecki Brasil – Sua fonte sobre o ator desde 2009!